Does your infant cry for hours and resists all your efforts to soothe him/her? Then he is probably colic. This term applies to any well fed baby who cries more than 3 hours a day, 3 days a week and more than 3 weeks. Colic is not a disease and doesn’t cause any harm to your child. But dealing with it can be can tough for both child and parent. Actually the exact reason is unknown, but the suspected reason is that the trapped gas in the abdominal cavity is the main reason for pain and discomfort. Pain, crying, moaning, cramps and finicky behavior are some of the symptoms of colic. In severe cases, symptoms include unstable body temperature, poor weight gain, frequent vomiting and a change in stools. There are different ways to ease and soothe the discomfort caused by colic. You can choose any method as per your preference from the list provided below. During the colicky times, a warm bath provides quick soothing effect on the baby. It also helps to distract, ease the pain and sleep. Fill baby’s bathtub with lukewarm water. Add few drops of lavender oil into it. Let your baby play or relax in it for as long as he/she wants. Meanwhile, you massage the tummy area gently to relieve the trapped gas. Pat the baby dry and put him to sleep. Repeat whenever the baby feels colicky. Chamomile contains 19 different antispasmodic constituents and 5 sedative properties which help to provide relief from intestinal cramping and induce relaxation. Into a cup, add 1 teaspoon of chamomile flowers and boiling water. Strain and pour the solution into a feeding bottle. Feed the solution to baby while it is lukewarm or at room temperature. Repeat the process once or twice in a day to get relief from colic. Note: Nursing mother can also drink it unless she is allergic to flowers. Warm compress is one of the simple remedy to provide relief from the discomfort. The warm temperature provides relief from the trapped gas and soothes the pain. Soak a soft hand towel in lukewarm water. Wring out the excess and place it on the baby’s tummy. You can rub it gently on the tummy in circular motions for few minutes to release the trapped gas. Repeat the remedy 2 times in a day. Note: Avoid using hot water bottle or heat compress on the babies. Mint contains antispasmodic properties that help to reduce the intestinal spasms and release the trapped gas. Now fill the cup with boiling water and cover this cup. Pour the solution into feeding bottle and feed it while it is lukewarm. Continue feeding mint tea daily once until your babies get rid of colic. Massage the tummy regularly with oil works wonders in reducing and preventing the colic pain. It ensures proper digestion and prevents gas. Take some warm olive oil into your hands. Gently massage the baby’s tummy in clockwise circles. Massage pelvis, hands and feet as well. Give him a nice warm bath and put him to sleep. This aromatic herb is rich in eugenol which possesses antispasmodic and sedative properties. They provide relief from the problem safely and quickly. Into a cup, add 1 teaspoon of dried basil leaves and fill it with boiling water. Steep it for about 10 – 15 minutes and strain the tea. Pour it into a feeding bottle and feed it to your baby while it is warm or at room temperature. Repeat this regularly until your baby gets relief from colic problem. Note: Nursing mothers can also drink basil tea to provide relief to their baby. This process is a century old remedy for treating colic in babies. It contains active ingredient called calcium channel blocker which helps to ease the intestinal distress and release the trapped gas. Mix few drops of peppermint oil into any carrier oil like coconut or olive oil. Mix well and massage it on the chest, stomach and legs. After few minutes, give him a nice bath and put him to sleep. Repeat the process regularly to notice the difference. Note: You can also prepare tea with fresh mint leaves and feed it to the baby while it is lukewarm. After feeding the baby, it is important to make him burp. It helps to release the gas and prevent air trapping the intestines. After feeding, hold baby against your shoulder and let him sit upright. Support your baby’s head and neck properly. Gently massage his/her tummy and back until you hear them burp. Repeat the process after feeding to prevent colic. Asafetida is one of the Indian home remedies for treating colic. It contains anti-flatulent properties, aids in digestion and provides relief from gas. Into tablespoon of water, add a pinch of asafetida. Mix well and heat the mixture. Allow it to cool down and rub it around the baby’s navel. Repeat this treatment 2 – 3 times in a day. Note: If you have started solid foods for your body, add a pinch of asafetida powder to their food. Breastfeeding mothers: into a glass of lukewarm water, add 1/2 teaspoon of asafetida powder and drink it twice a day. Fennel is one of the wonderful herbs which provides relief from gas and general stomach related discomforts. This process can be followed by both babies and fennel seeds. Into a cup of hot water, add 1 teaspoon of fennel seeds. For babies: 1/2 – 1 teaspoon of fennel tea 2 – 3 times in a day. For breastfeeding mothers: 2 or 3 times in a day. Repeat the process daily until the colic is relieved. Massaging with mustard oil helps to improve blood circulation and encourage bowel movement which expels the gas from the intestines. Heat a small amount of mustard oil with few cloves of garlic. Let the oil cool down completely. Strain and massage the oil on baby’s chest and feet. Water is one of the simplest techniques to calm your baby. The sound of running water is said to soothe the baby and make them fall asleep. Let them hear the water cascading into bowl. If your kitchen sink is not producing enough volume then you can try bathroom sink, as this may accentuate the soothing sounds of water. Gripe water is one of the remedies used all over the world to treat the colic, gas and other intestinal problems in babies. It is an infusion of sodium bicarbonate and herbs like chamomile, fennel, peppermint, ginger and caraway. Feed 1/2 – 1 teaspoon of gripe water to baby whenever he/she feels colicky. Gentle exercise is very important for your baby as it improves the digestion and bowel movement. A simple knee bending exercise is helpful in relieving colic. Lay baby on his back. Gently, hold both knees together. Slowly, bend the legs and push them towards the tummy. Hold the position for 4 – 6 counts. Repeat the process several times daily. Note: Avoid doing this exercise forcefully or when your baby doesn’t want to to. You can also use other herbal remedies that are listed below. You can prepare tea by using any one of the herbs mentioned below are feed the baby. Consult your pediatrician to know the extact dosage. Ginger: helps to treat nausea, muscle spasms and encourages smooth digestion. Aloe Vera: helps to relieve bloating related to gas. Lemon Balm: related to mint family, helps to soothe, relaxes, encourages sleep and helps to relieve gas pains. Vegetable Charcoal: helps to eliminate body toxins and absorb gas. Light Peony Leaf Leaves: works wonders for infants with colic. It helps to reduce the pain and release the air trapped in the colon. Light Orange: provides relief from any discomfort caused by colic. Catnip: It is one of the highly recommended herb for providing relief from colic. Anise: provides relief from bloating, cramping and indigestion. Bay Leaves: quick relief from the trapped gas in the intestines. Carom Seeds: provides relief from stomach ache. Cardamom: provides relief from stomach cramps, bloating and colic. Make sure your baby gets enough physical exercise. It helps to improve digestion and regularize bowel movements. Colic is not a serious medical problem and doesn’t threaten their health. It is a stage of child’s development so let it pass soon by staying calm. Protein present in cow’s milk is also one of the reasons for colic problem. Research says that there will be an improvement in colic after eliminating the dairy products from your babies’ diet. So, try to eliminate the dairy products for 2 weeks and switch to soy products and you’ll notice the improvement in 3 – 4 days. If not then assume that milk isn’t the culprit in this case. If you are breastfeeding, then take away dairy products from your diet. Adding fiber to your baby’s food will help to reduce the colic problem. Starting from 1/2 teaspoon 3 times a day and increase it to 1/2 teaspoon 6 times a day will do the trick. If you reached to a point of near madness due to your baby’s crying, then it’s time to have a long, hot shower to relax your shattered nerves. But make sure your baby is not left unattended. Keep a track of record of your baby’s weight, frequency and length of crying bouts. It helps to track his or her progress. Keep in touch with your pediatrician to get valuable ideas, experiences and assurance. Try to maintain as much as direct contact as possible. Pediatricians also recommend that carrying and cuddling a colicky baby as much as possible will help to reduce the colic condition. Nursing woman have to take care of her diet. Avoid taking foods that can trigger excess gas. Foods to avoid include dried sea food, coffee, citrus, spicy meats, tomatoes, cabbage, beans, chicken, nuts, eggs, pulses and spices. Try to hold your baby an upright as possible during feeding. Also choose bottles that have disposable and collapsible bags will lessen the amount of air the baby swallows. Sucking provides soothing affect to the baby’s either it can be breast feeding or offering a pacifier to calm your baby. Apply fennel oil on baby’s stomach also helps to reduce the discomfort caused by colic. A pacifier or repetitious sounds like noise of a fan or humidifier helps a colicky baby to sleep. Playing soothing music is one of the best way to relax your baby from colic. This helps to distract your child from the problem. Singing a lullaby to the colicky baby or setting a background music will divert their attention. Many parents mistaken by cheering the colic babies in loud voices. But this doesn’t soothe them. It is better to soothe them in a dark room and talk to her in soft tones. Probiotics are one of the best rescues for colic. The good germs will improve the digestive power and provide relief from colic. Gently pat her back can whenever he/she strains her face and clenches her fist. If you are nursing women, then avoid smoking and drinking because it increases chances of colic in babies. We hope the information provided in this article was helpful for you. If you have any queries or suggestions, write to us in the comment section below. We will respond as soon as possible. Make sure to write your experiences as it can help others deal with the problem. can activated charcoal relieve colic in infants? We don’t recommend activated charcoal consumption for infants. 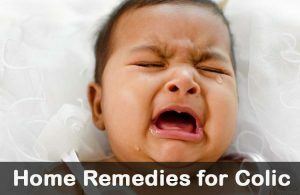 Try a different remedy from the above mentioned article for relief from colic. Can I give my 4 weeks old dill seed tea to relieve colic? And does it actually work? Yes, you can but start with a very dosage (1 – 2 drops) and slowly increase to 1 – 2 teaspoons. I have a 3 week old, is it ok to give him coconut water to relieve gripe? My 4 weeks old had colic, really bad one. I was listening his crying all the time that was driving me crazy. I tried every possible remedy under the sun but nothing was going to help my poor little one unless I put him on Babies magic tea. It was like a miracle for my boy.